Sarah Burton’s collection was the perfect encapsulation of the changing times, but done with poetry and precision. It beautifully showcased metamorphosis through the house’s easily recognisable armour-inspired bustier dresses, silk-printed dresses and separates with a variety of butterfly prints. The finale showed dresses with elaborate sleeves in silk taffeta and lots of fringe. Demna Gvasalia is one of the designers bringing back the logo trend, and it’s nice to see that he’s doing it with purpose. In this collection, T-shirts layered under numerous anoraks and jackets, were emblazoned with the United Nations’ World Food Programme logo, with proceeds to be donated to the cause. Also of note were the precision-tailored peplum jackets—remakes of sold-out styles from recent collections—and Gvasalia’s favourite floral blouse and pencil skirt combos. Raf Simons likes to put on a show and partnered again with longtime collaborator Sterling Ruby for his latest. The designer set his show against a popcorn-filled runway where everything was unexpected, including the models, who walked in looking as if they’d just come straight from the street wearing roadside construction coats. Pretty prairie dresses were styled with homespun ski caps and metallic leather motocross gloves. 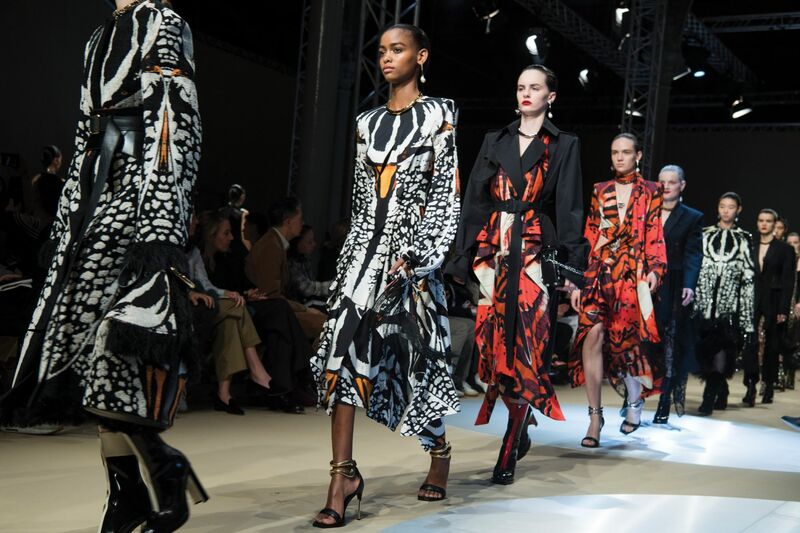 There was no runway show for the Paris powerhouse, whose collection was designed by its in-house team, reflecting the switch between Phoebe Philo’s departure and Hedi Slimane’s imminent arrival. Set in the showroom of Céline’s headquarters, the last collection under Philo’s purview featured plenty of the minimalist brand’s classic oversized silhouettes, such as parachute pants in glossy leather and asymmetrically draped dresses in large floral prints that stood out among the largely monochromatic pieces. Accessories continued to be a highlight, but a string of purses slung into one shoulder bag and a hair fastener styled as a sweater detail were standouts. Karl Lagerfeld took audiences into the woods this season—literally and sartorially. Real French rose arbour trees and autumn foliage filled the space under the glass r oof of the Grand Palais and were reflected in the leaf-print jacquard Victorian-collar dresses and the log clutches held by the models. The house’s signature tweed ensembles couldn’t be missed, refreshed with peplum hems and paired with metallic gloves and boots. For her second runway show at Chloé, Natacha Ramsay-Levi offered up another bold collection, this time infused with sexiness in the form of shirt dresses with deep collars open to the navel. Abstract zig-zags, horse motifs, and other western influences continued to dominate the textiles, which were balanced by a bevy of feminine details like lace on silk and puff-sleeved knits, and blouses cinched with Wonder Woman cuffs to give shape. The ever-popular Rylee boot and Roy bucket bag also got upgrades in new fabrics, including velvet and glossy patent leather. Feminist trailblazer Maria Grazia Chiuri paid tribute to 1968, the year Dior’s first ready-to-wear line was created and the year that saw many democratising social changes sweep across Europe. This meant plenty of ’60s-inspired patchwork boots and skirts paired with sheer lace blouses and paperboy caps. Boxy purses with Dior’s now-signature guitar straps were slung cross-body over preppy skirt-suits and knits plastered with the symbol for peace. Chiuri’s favoured Swiss dot tulle made its way into a handful of looks as well. Ethnic futurism is how Veronica Etro described her collection, which was filled with dizzying patterns, a lively western colour palette, and bold tapestry embellishments, making the outfits look like their inspiration came from all corners of the earth. The house’s traditional paisley print was masterfully reworked onto everything, from highneck silk dresses to knit coats, while crochet handiwork found its way onto trims and coat hems. Wallpaper florals, jacquard stripes, and intarsia knitted motifs added to the wanderlust of the collection. Silvia Venturini Fendi’s penchant for architecture (her HQ is the stunning Roman palazzo known as the Square Colosseum) was on show in the bold square shoulders and strong silhouettes of the collection. There were Prince of Wales checks and argyle jackets softened with pleated skirts, boxy-shouldered jumpsuits, and caped dresses topped with needlepoint collars and bandanas. Accessories were equally covetable, each look finished with a pair of heeled cowboy boots. The Fendi logo also got a refresh—this time, surprisingly, in partnership with sportswear giant Fila. Created by Instagram artist Hey Reilly, the logo appeared on a variety of ready-to-wear and accessories. The power suit of the ’80s was what made Armani famous, but its evening wear has also shone through in recent years, with A-list actresses, including Cate Blanchett, Nicole Kidman, and Julianne Moore flocking to the label for red-carpet occasions. Armani has brought back a softer version of the look with feminine combinations of blouses and skirts for daywear. Evening wear stole the show, however, in particular a sheer floral-embroidered gown and a power suit crafted from rich black velvet with crystal pinstripes and finished off with sparkly fringed gloves. Being commissioned to design Meghan Markle’s wedding dress really put the spotlight on Clare Waight Keller’s first collection at Givenchy. It's no wonder she has gone for a subdued, dark, and moody feel with her second joint collection for men and women. With film noir as her inspiration, the artistic director highlighted sleek, sharp tailoring and plush outerwear in faux fur (perhaps in support of sustainability efforts by owner LVMH). Other notable designs were delicate, top-to-toe sequinned evening wear, lace slip dresses given a tougher edge with boots, and tier ed ruffled dresses in metallic fabrics. Alessandro Michele played with the notion of super- and trans-humans in what was perhaps one of the most shockingly wonderful shows of the season (it was set in a mock-up of a hospital operating room). Some models carried life-sized versions of their own heads as accessories; others wore face cover-ups and giant glasses, or held tiny pet dragons that looked like they came straight from Game of Thrones. The theatrics extended to the clothes’ multidimensional aesthetics, a signature of the brand’s recent seasons. There were oversized sequinned blazers and velvet dresses, logoed legwear and chunky hiking boots, all layered enthusiastically together. It was a more-is-more collection to say the least, the essence of what Michele is all about. Can a long trench coat be seductive? When it’s styled by Hermès, the answer is a resounding yes. The French maison outshone itself, presenting looks sensual in an eminently subtle kind of way in a homage to power women. Head-to-toe black leather ensembles opened the show, setting a broody, alluring tone. They were followed by pencil skirts, trousers, and slim dresses for everyday city life, but also luxurious outerwear in the form of fur and duffel coats that hinted at days spent in the country. As expected from Hermès, the details were everything—from pyramid-shaped studs to mid-sized bags decorated with little metal hoops. Our personal favourite? The poncho-esque equestrian print blankets that made up an entire section of the show. Classic Hermès. The Loewe silhouette for the season is all about soft curves and feminine lines. The Paris show r evealed a collection of delightfully loose shearling coats, safari suits with oversized pockets, and snug sweaters in rich fabrics and with crafty details. Dresses showed relaxed tailoring and voluptuous fluidity, matching the buttery leather accessories the Spanish brand first made its name with. Designer Jonathan Anderson successfully created a collection versatile enough to please a diverse range of women. Against the striking backdrop of the old horse courtyard of the Louvre, Nicholas Ghesquière presented a highly wearable collection. Cropped jackets and knee-length pencil skirts spoke of inimitable French chic, as did ladylike heels and cocktail dresses. The most exciting aspects of each look were the extra details: corset-like belts on trouser suits, layered hardware on jackets and skirts, elaborate beadwork on draped halter tops, graphic harnesses strapped across shoes. It’s there that Ghesquière showed really exciting work. The American designer presented a gamut of looks fusing winter florals, faux fur, houndstooth, and even some zebra prints to cater to all tastes. The mash-up was injected with a series of inviting, bodypositive clothes, from tartan plaids and ’40s-style slip dresses to oversized coats and sparkling embroidery. To showcase the runway looks, Kors chose an equally diverse cast of female and male models of different sizes, ethnicities, and ages. It was feel-good fashion at its finest, one covetable outfit after another. Retro’s the word at Miu Miu. The show was nothing short of a stroll down memory lane. Miuccia Prada started in the ’60s, with models sporting high quiff hairdos and bold winged eyeliner coupled with buckled boots, chiffon neckerchiefs and ruched floral dresses, and went as far as the ’80s, including such staples as acid-washed denim ensembles, puffy-sleeved jackets and bright baggy sweaters. The collection was full of strong, personality-driven looks laden with nostalgic touches, and the model lineup was nothing short of spectacular—Elle Fanning opened the show and Kaia Gerber, Georgia May Jagger, and Adwoa Aboah made appearances. Natasa Cagalj put a strong focus on the fabrics, presenting a well-edited collection of 33 looks that were sartorial samples of minimalism—all loose shapes and oversized silhouettes, chunky logoed knits, and slouchy ensembles with a strong focus on outerwear—to make the textiles the real showstoppers. And they were. Beautiful mohair, glossy cotton, and sequin strands, prime Italian wool and “Made in England” capes showing care instruction slogans. It made us yearn for winter, layers, and wrapping up. Prada’s Milan show was one of the season’s most controversial, with Miuccia Prada presenting a collection at the intersection of politics, sociology, and commerce, with feminine elements—sequins, florals, bows—sitting pretty against menswear’s fabrics, high-tech materials, and sporty elements. There were contrasts aplenty—dressed-up outfits and street-style merchandise, utilitarian workwear and ballerina tulles. The overall effect was one of provocation and dissonance, which is exactly the nature of the times we’re living in. Hybridising different materials has always been the bread and butter of Japanese fashion house Sacai. Designer Chitose Abe has taken it up a notch, mashing silk ruffles with turtleneck sweaters, and slicing a long check trench right down the middle and fusing it with a shorter knit jacket. There were military coats with fur linings slung half-on, half-off, glossy quilted puffers curled around fitted blazers, and some models even wore shoes sporting different animal prints on each foot. Anthony Vaccarello started his show opposite the Eiffel Tower with a parade of black ensembles showing influences from around the globe. Models wore military jackets with cheongsam fasteners, cowboy tasselled shawls, and sheer lace blouses with Victorian sleeves topped by tall velvet fedoras dipped mysteriously over the eyes. After showcasing architectural minidresses paired with extravagant feathered stilettos that previous seasons were known for, the collection burst into colour with every combination of sequinned floral frock imaginable, all with extra short hems, strong shoulders, and plunging necklines—signature Saint Laurent. All eyes were on the debut ready-to-wear collection of Paul Andrew, who was promoted to creative director from his role as the Italian house’s womenswear shoe designer. The shirts and shirtdresses with stiff collars (accented with collar pins) and tailored coats were clearly influenced by the house’s menswear designer, Guillaume Meilland, who showed a matching collection alongside Andrew’s, and paid tribute to Katharine Hepburn’s inimitable borrowed-from-the-boys look. Tod’s honed in on a palette of earthy autumnal hues. Models paraded down the runway in the Italian house’s tried-and true designs—mixed shearling bombers, faded yellow anoraks, and paper-thin leather trousers, all in practical silhouettes that would make travel stylishly simple and comfortable. Looks were finished off and accented with utilitarian tool belts holding snap pouches, totes in exotic skins, and puppies. Yes, puppies. In a departure from the micro-fl orals used in previous seasons, Pierpaolo Piccioli went larger than life for fall, creating a collection of gigantic fl ower patterns and flowy tunics with scalloped hems and oversized hoods in a vivid palette. There were ruched handbags, princess collars, and billowing trousers in colours that ranged from pretty pastels to bright, bold greens, and yellows as the show progressed, culminating in a romantic garment garden. Technicolour plaid, chain belts, and soccer scarves galore—Versace’s latest collection revisits the ’80s classroom with a preppy and vibrant collection. Coming off last season’s tribute to Gianni Versace, the new pieces—while still built on the Italian house’s classics—introduce a super-punk edge, with vinyl trenches, clashing high-octane pop prints, and dramatic silhouettes toned down with an oversized blazer here or a best-selling T-shirt there. School never looked so cool.